I lied. A couple of things are changing after all. 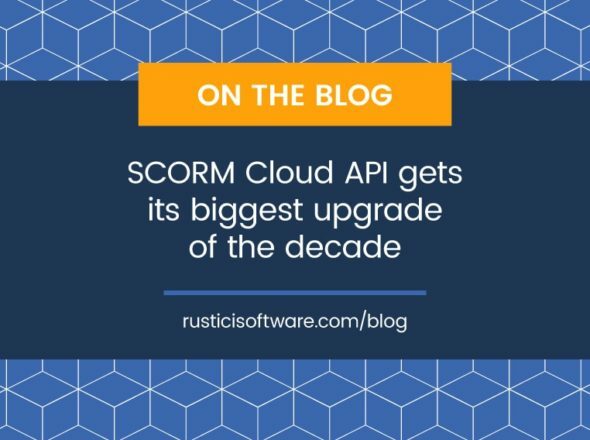 Rustici Software has been around for a long time, and over that time we’ve been able to evolve our products to support technologies that go past SCORM. Today, you’ll find support for SCORM, xAPI, cmi5, and AICC in all of our products. In Cloud Dispatch, we offer support for LTI. Not only are we excited about all of these standards, we’re always looking for new technologies to support in our products. Who knows where we’ll go next? This growth has left us with a few problems. All of the great products we build live at SCORM.com but do so much more. The resources we provide for people who want to educate themselves on the eLearning standards are combined with our commercial products on SCORM.com and xAPI.com, and it’s not always obvious what solutions we offer when folks are visiting RusticiSoftware.com. To address this we’ll be rolling out some updates to our sites and product names. I know what you’re thinking, I lied about some changes happening here, but you’ll be glad to know that we are updating the styling of our websites. More importantly, we’re going to be reorganizing our sites to make sure you find our products when you’re looking for eLearning products and solutions on RusticiSoftware.com and great technical resources at SCORM.com and xAPI.com. Lastly, the upcoming changes to our product names will make it clear that we support a whole lot more than just SCORM. As always, our hope is that these changes make it easier for our customers and the community, to find the products and resources they need. For us, this opens the door for Rustici Software to continue to explore other ways we can help our customers connect to tools and systems that go beyond SCORM.